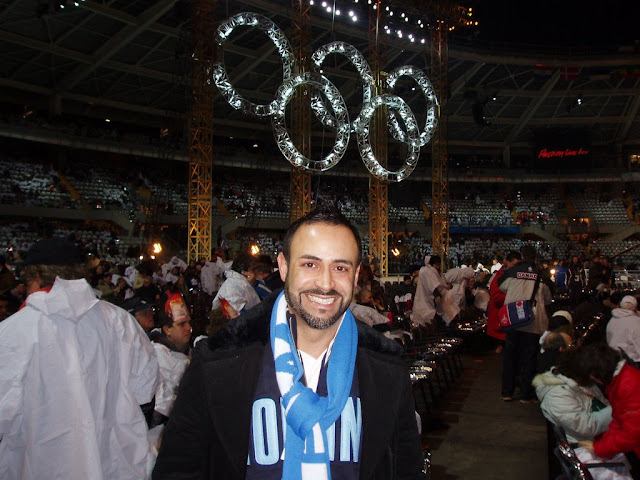 Six years ago, my NIKOLAKI-partner-for-life David Paul and I attended the Torino Winter Olympics Closing Ceremony. It was good but NOT London 2012 Closing Ceremony good!! I think the highlight of the Torino one was Ricky Martin--he was VERY big then and performed his "Ole Ole Ole...Cup of Life" song! But the London Closing Ceremony was a major celebration of British Music, dance, the 80's (George Michael AND Pet Shop Boys! I felt like I was 19 all over again!!!). 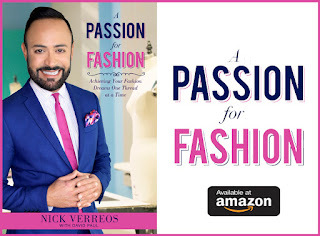 And then, what really made me get up and start doing my "Nick Runway Walk" in my TV room was when they brought out the Supermodels and the Super Fashion! 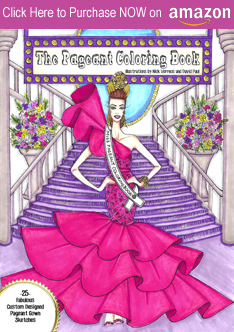 Now here's a surefire way to get a fashion designer's attention! Thank you Closing Ceremony Producers. The Closing Ceremony Fashion Spectacle began as eight big "billboard trucks" made their way into the Olympic Stadium. 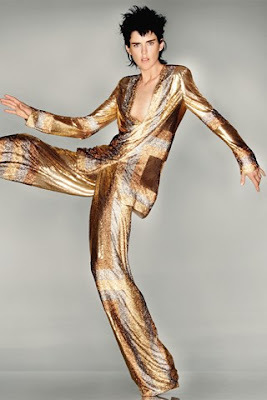 To the musical backdrop of David Bowie’s "Fashion", the black and white billboards were pulled back and BAM!, the billboards fell away to reveal the gold-clad models--all Top British Models wearing Top British Fashion Designer's couture. 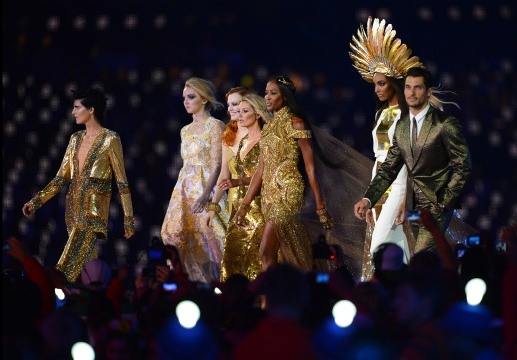 Golden Gorgeous: (left to right) The only male model in the Closing Ceremony Olympics Catwalk, David Gandy in gold lurex suit by Paul Smith with Jourdan Dunn in a Stephen Jones feathered headdress and Jonathan Saunders ivory jersey with gold lame column gown; Karen Elson in a slit-up-to-there gold strappy gown from the House of Burberry. Sequined Super: one of the MAJAH SUPER Models in the group--the one and only Kate Moss wore a Sarah Burton for Alexander McQueen bias cut golden sequin gown with cap sleeves and scooped neckline. She SLITHERED on the runway like it was 1994 kids!! Flared Blue Blood: Georgia May Jagger (yes, Jerry Hall and Mick Jagger's beautiful daughter) in gold silk gazar a-line dress from Victoria Beckham--there was criticism on the web-o-sphere about Beckham being included here as one of the "Top" iconic British Fashion designers, and some people suspected that this might have been a "requirement" of sorts--contractually, if she was to perform with the rest of her Spice Girls...who knows...I think it was a very pretty dress. La Diva: And finally, Miss Naomi. Yes, kids, it wouldn't be a British Fashion Show to End all British Fashion Shows WITHOUT Miss Naomi Campbell. And she delivered darlings. Campbell STOMPED onto the London 2012 Closing Ceremony catwalk showing EVERYONE why she is who she is and why she can throw cell phones at anyone she wants---in an iridescent golden tulle dress from Sarah Burton of Alexander McQueen. 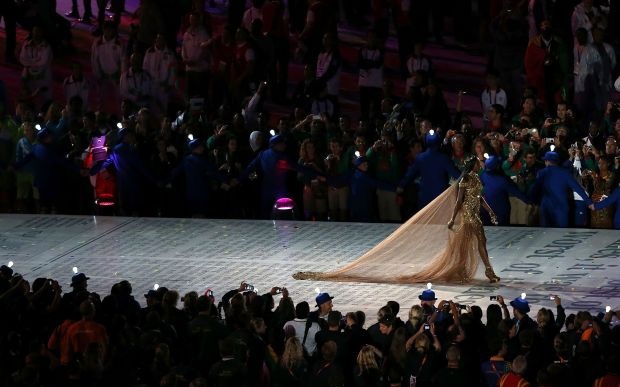 The gown was very Olympics Warrior Goddess and naturally, included a dramatic and very long train. Cheers to British Fashion, British Models and yes, the London 2012 Olympics! 0 Response to "OLYMPIC STYLE.....Fashion Show at London 2012 Olympics Closing Ceremony"